Our partner school, CLIC International House Malaga, is located in the very heart of Málaga, right next to the famous calle Larios, the main street, and the Plaza de la Constitución. The school building consists of 8 bright, fully equipped classrooms as well as comfortable common areas. If you wish to study in the centre of this Andalusian city, this is the best option! With other schools in Cádiz and Seville, CLIC has years of experience when it comes to Spanish teaching. The school in Málaga offers Spanish Intensive courses for adults (17+), DELE Preparation courses, 50+ courses and English CELTA training programmes for teachers (please contact us if you want more information about these courses). 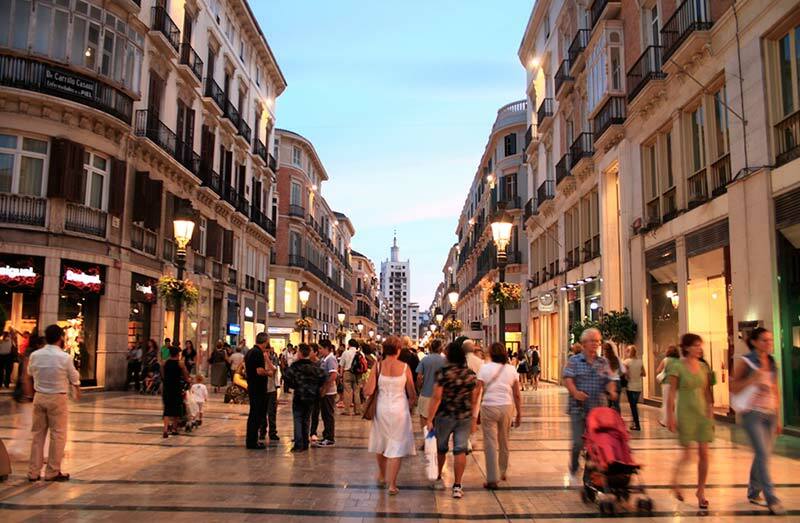 In addition to Spanish language teaching, the school offers you the opportunity to dive into Spanish culture by participating in fun and cultural activities in Málaga city. During the weekends, you can join a full-day excursion to one of the many interesting places that Málaga and the Andalusian region has to offer. This way you will get to know Andalusia during your language course. The intensive course consists of 20, 25 or 30 lessons per week, from Monday to Friday. The main course of 20 lessons takes place from 09:15 to 13:00 (during high season possible from 11:20 – 15:10). The course with 25 lessons combines the main course with 5 additional conversation lessons. The timetable is from 09:15 to 14:20. If you choose the option of 30 lessons per week, classes will be held from 09:15 to 15:10. Classes consist of maximum 10 persons per group. A double room can only be booked when travelling together. Students are required to pay a deposit of € 150,- upon arrival, which will of course be refunded when the room is handed back undamaged upon departure. For the Easter week period (14-21 April) and the Feria (17-25 Aug) availability is very limited and prices are on request. A double room can only be booked when travelling together. Students are required to pay a deposit of € 150,- upon arrival, which will of course be refunded when the room is handed back undamaged upon departure. The price stated here is for an airport transfer upon arrival at Málaga airport (AGP). In 2019 the school is closed on the following days: 01/01/2019 - 07/01/2019, 28/02/2019, 18/04/2019*, 19/04/2019, 01/05/2019, 15/08/2019, 19/08/2019, 09/09/2019, 12/10/2019, 01/11/2019, 06/12/2019, 09/12/2019, and from 21/12/2019 - 06/01/2020. Only private lessons will be rescheduled. On bank holidays coinciding with a Monday (07/01, 19/08, 09/09, 09/12), new students will have their level test and introduction, but lessons start on Tuesday. This course combines the general intensive course of 20 lessons with 5 or 10 private lessons per week. The total number of lessons received, combining group and private lessons will be either 25 or 30 lessons. During the individual lessons, one can really focus on the aspects of the language that still need improvement. The DELE (Diploma de Español como Lengua Extranjera) exam preparation course prepares you for taking this official exam, accredited by the Instituto Cervantes. You will need a minimum level of A2 to enter the course. In case you wish to take the exam after your course in Málaga, please contact us for the correct starting dates and the exam date that matches your level. DELE exam generally take place in April, May, July, October and November. For more information about the DELE exam, please see here. Starting dates depend on the duration of your course and the exam date; please contact us for more information. Are you aged 50 or above, and do you want to learn Spanish with people of your own age? The Club 50 course combines Spanish language learning for 50+ students with cultural activities. This 2-week course with 20 lessons per week includes: a welcome drink, orientation tour, cultural activities such as a visit to a museum, a flamenco show, a cooking class and a dinner in the company of the teacher. Depending on the starting date, there is also one theme-oriented activity scheduled, according to one of the following themes: Wine and gastronomy, History and modern art, or Flamenco. Individual lessons can be tailor made and adjusted to your needs and interest. This is the best way to improve your Spanish level in short time, or if you wish to improve your knowledge in specific work-related field. Prices include 20 individual lessons per week, but it is possible to book fewer, or even more lessons on request. Staying with a host family makes your language immersion complete! Not only will you learn Spanish during the classes at school, but you get the change to practise your skills with the local 'malagueños' and also get more insight into their living habits. You can choose to stay in a single with half board (2 meals a day). Shared rooms are also available for students travelling together. Host families live at an average of 20-35 minutes walking distance from the school, or approx. 15 minutes by public transport. When you stay in the shared apartment (with Spanish or international students), you will stay in a single or shared room. The common areas such as bathroom, kitchen and living room are shared between the students in the apartment. The residence “El convento” is located right in the heart of the historic centre of Málaga, near the famous Picasso Museum, the Roman Theatre and Alcazaba (Moorish fortress). You’ll be surrounded by a great atmosphere and lots of shops, restaurants and cafés. You stay in a single or double room (only for 2 people travelling together) and have a private bathroom. Kitchen, dining room and living room are shared with other students. There is a courtyard and free Wi-Fi available. The schools offers two residences, both have the same price. One of them is located at only 3 minutes walking distance away from the school. This is a basic residence where you will stay in a single or shared room (when travelling together) with shared bathrooms (there are a few bathrooms / showers on each floor). Breakfast is included in the canteen of the residence. There is no communal kitchen and no washing machines, but on week days, lunch and dinner can be bought paying directly in the canteen (not possible in the months July – September). There are common areas with TV and computers, and a library. When you choose the accommodation in the mini-residence, you’ll stay in a single room, in a building located in a lively neighbourhood located near the big warehouse “El Corte Inglés”, at only 12 minutes walking distance to school. The building offers 8 rooms, 4 bathrooms (shared), a fully equipped kitchen, and a small living room with a balcony. You have lots of shops and supermarkets in the neighbourhood. The beach is at 30 minutes walking distance, the bus and train station at 18 minutes walking distance. If you prefer to have your own place while studying Spanish in Málaga, we recommend a stay in one of the studios. All studios come with their own bathroom and kitchen and they are also all located within walking distance from the school.